Own a bakery or catering service? Looking for a unique way to display your gourmet creations like cakes and appetizers? 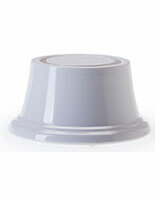 These cake pedestals are a great way to elegantly display any baked goods. 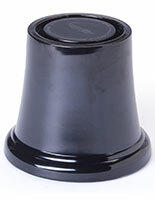 The pedestals are designed with a flat top so that any platter can rest comfortably. Bakeries love to use pedestals within display cases for customers to get a better viewing angle. These white and black stands come in three different heights (1.75”, 2.75”, 3.75”). Bakers or banquet planners can set up different arrangements to put desserts at staggering heights. Display dessert and sweets trays at lower heights and then put the celebratory cake at the highest level, making it prominently stand out. 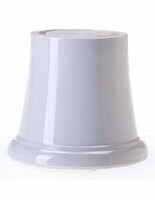 Cake pedestals are a simple touch that can really add to any function. Caterers also love to use these platter stands. Appetizers trays can easily be taken off the stands and carried around by servers. This is ideal for weddings and formal functions where there’s a cocktail hour. Once a platter has been walked around several time, servers can then place it down on a platter for people to help themselves.